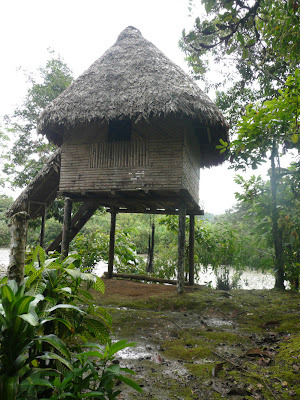 We awoke early on our first morning in the Ecuadorian Amazon. We were to meet Howard and Eve for breakfast and then hook up with our guide, Patricio. 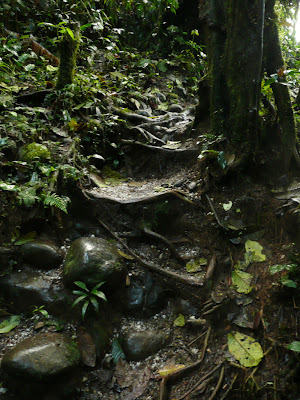 At 8am we met the guide who had us fitted with vinyl boots and ponchos for the rainforest. Next the four of us; Howard, Greg, Eve and myself, walked over the suspension bridge and boarded the little, rundown mini van. Along the way Patricio stopped to pick up his buddy who hopped into the front seat. After about 30 minutes of beauty filled, scenic drive, we stopped due to construction blocking the road. Patricio got out to discover that a large drainage pipe was being put in. 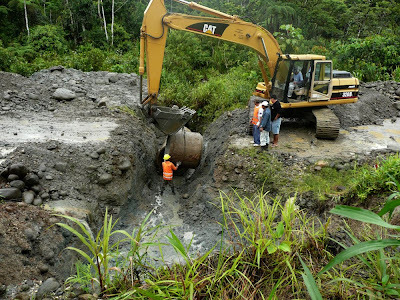 He was told that a drainage pipe was being put in and it would be about an hour before the road would be open again. An hour later it became evident that the work was not going to end any time soon. Thus we piled out of the van and began our tour by foot. The intention was that our guides friend would wait with the van and catch up to us later. We were thilled to get out of the van and walk, even though it was raining and the way was extremely muddy. The reason for our ponchos and rain boots became quite clear. Patricio had uncanny skills of perceptive. While walking he stopped us and said "Look a Blue Morpho!" The Blue Morpho is a gorgeous, electric blue Amazonian butterfly. We peered into the thicket of rain forest shrubs and saw nothing, eventually we spotted the butterfly perched on a branch. Onward we went with Patricio pointing out different flora as we walked. Soon we arrived at a fish farm which consisted of two square ponds in the grass. The water was very cloudy, preventing us from actually seeing the fish. Tilapia were along with another, very large fish that resembled a serpent. 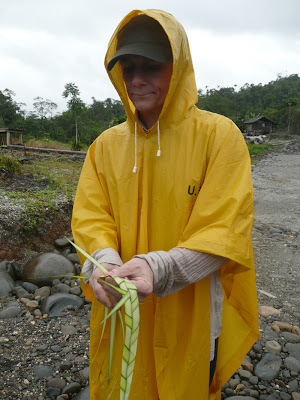 As we left the fish farm and walked on our guide indicated a type of palm-like shrub, that is actually a perennial herb, Carludovica palmata, used to make the infamous "Panama Hats." Using the natural leaf fibers we created a woven headband. It was a bit challenging at first but eventually we were all weaving the long pieces to create our very own handmade headbands. 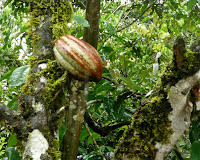 As we continued along the road Patricio pointed out a cocoa tree with one of the football shaped fruits. We were all surprised at how the reddish pink and brown striped fruit grew right out of the trunk of the tree. Next our guide cracked open a small red spiky fruit which contained white seeds. The fruit is known as Achiote, Bixa orelana. 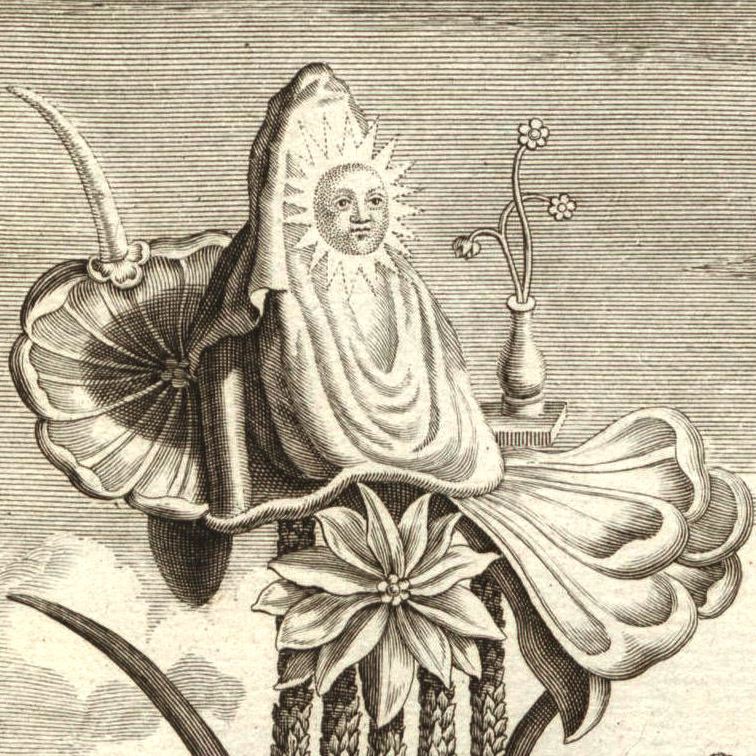 As he rubbed the seeds with his finger they turned bright red. He said this was a water soluble dye used for coloring food, hair and textiles. The plants nickname is "lipstick tree", the dye is utilized in cosmetics as a natural alternative to synthetic coloring agents. 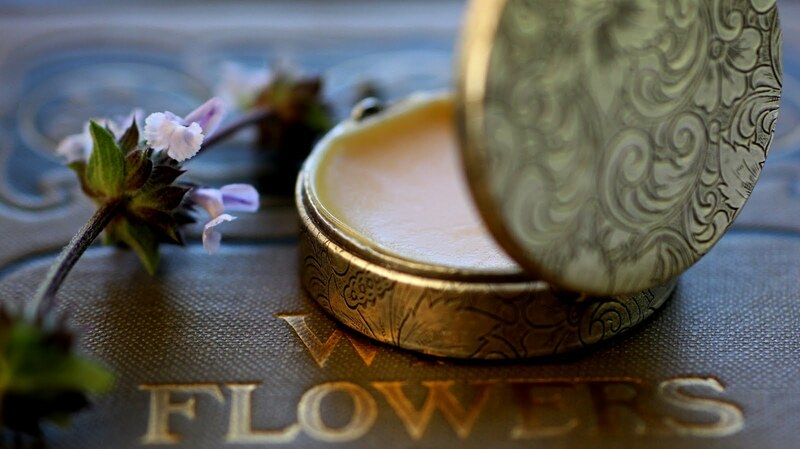 In ethno-medicine it has a variety of uses. Patricio proceeded to paint a few marks on our each of our faces with the dye. 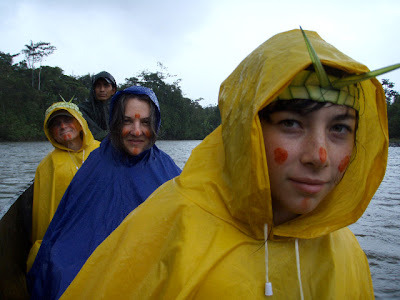 We walked in bliss with our bright colored ponchos, red marks on our faces and handwoven headbands. Eventually the weather grew warm and we were able to remove our ponchos. Once again Patricio stopped us as he went over to a large, brown woody-oval mass and placed his palm on it as if conducting a healing. He came over to us revealing tiny little bugs crawling all over his hand. We learned that the large, brown woody-oval mass was a termite nest. He then rubbed his hands together and all over his arms crushing the little bugs. Once done, the bugs were gone and all that was left was a gorgeous sandalwood-like aroma. Patricio said the wax from the termites is a natural insect repellent, extremely useful against mosquitoes. Upon hearing this and becoming completely intoxicated by the aroma I too wanted to try this technique. Lucky for us mosquitoes were no where to be found. I considered tincturing the material but then realized that it was a "natural" ingredient, thus would not work for botanical perfume. The woody fragrance of the termite wax still haunts me, it was sublime. We walked on, enjoying the sights, and soon met up with the van. This next phase of the adventure began by walking into the jungle, prior to this moment we were walking along the main road. Off road we went, through the tangle of branches, streams, vines and logs that served as bridges. Images from Raiders of the Lost Arc were prominently in mind. Eventually we arrived at a clearing just at the rivers edge. This small village with thatched huts. served as a hotel, restaurant and departure site for our canoe ride. We left our backpacks with our guide and hopped into a wooden canoe for a ride down the River Pastaza. As we glided across the dark muddy water we were all very silent taking in the beauty of our surroundings and the exquisite sense of peace that impregnated the area. The end of our canoe ride was upon us, we disembarked and met up with Patricio who took us to a new hotel built right on the edge of glorious lookout point. Although the day was gray and cloudy the expansive view was thrilling. 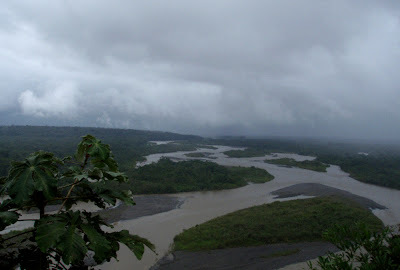 Below us stretched the Amazon in all her splendor with the River Pastaza and her tributaries. During the rainy season the basin fills with water. The hotel was stunning and would serve as a great location for a workshop, something I noted as we walked back to the van amongst the thriving native flora and fauna. 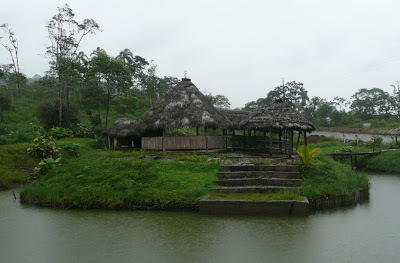 We headed back to the thatched hut village for our lunch of tilapia, baked yuca root, rice and fruit salad for dessert. 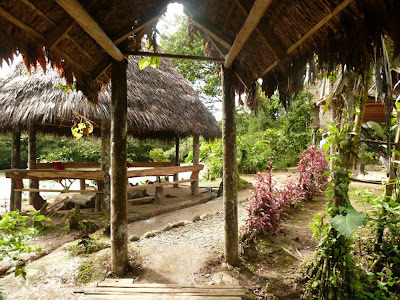 There was quite a diverse group of people staying at the primitive jungle hotel. 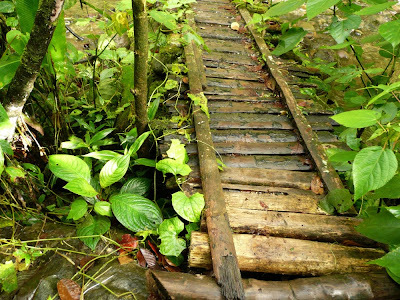 After lunch we grabbed our packs and followed Patricio across a bridge and into the jungle. Once again as we walked our tour guide educated us on a variety of different plants and their uses by the indigenous community. Above is a photo of Patricio making a cut into the trunk of a tree called Sangre de Drago which translates as Dragons Blood. This plant shares the same common name as many others, although goes by a completely different Latin name, Croton lechleri . There seemed to have been a tendency to call any bright red resin Dragons Blood. 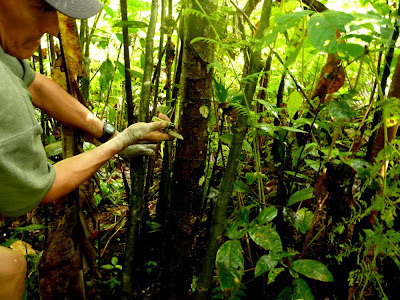 The variety from the Ecuadorian Amazon is , when cut the bark exudes a dark, reddish, resinous latex. 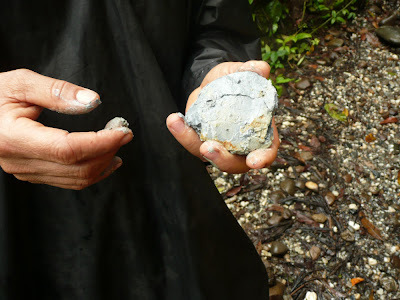 Patricio shared that the indigenous people of the area use it specifically for wound healing. Upon further research I have discovered that it is fabulous indeed for wound healing, especially applied to a burned area, as well as a variety of other dis-eases of the body. 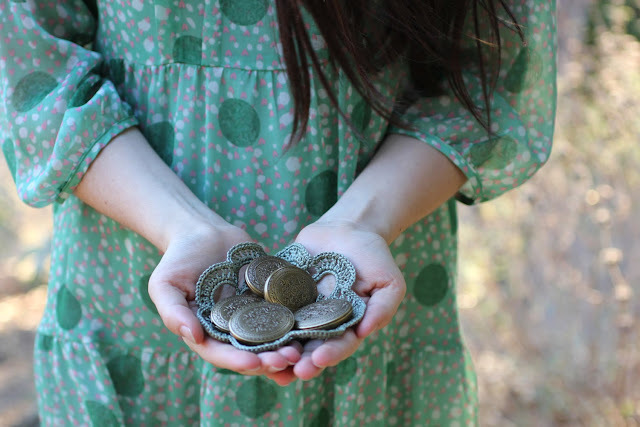 As we walked along, Patricio walked down to the rivers edge and brought back with him a gray blue rock. As he rubbed water into the rock a clay-like texture developed. 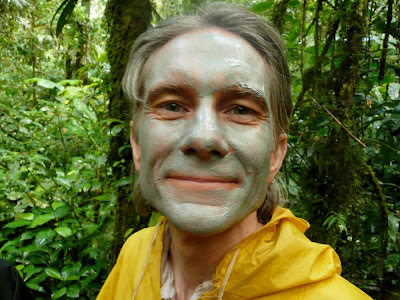 He covered each of our faces with this blue gray material indicating that the clay was good for clarifying our skin. This was the "spa" experience of the journey. 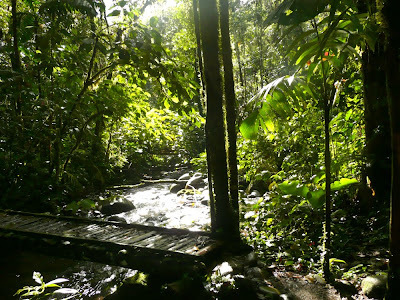 After a long enjoyable and educational walk through the jungle, we came to a wooden bridge over a creek that once again brought up the Raiders of the Lost Arc archetype in my mind.. Across the bridge we could see gorgeous waterfall named "Hola Vida" which translates as Hello Life. It was a spectacular fall with quite a bit of force. Greg and Howard striped down there in the open and took a dip in the cool waters. Eve and I were feeling a bit more modest about changing into our swim suit right there in open view so we did not indulge in the natural pool. Next time I will be prepared and wear my swimsuit under my clothes! 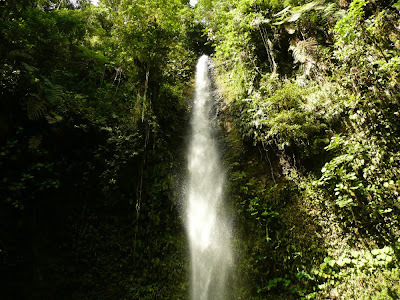 We enjoyed the peace and tranquility of the waterfall for about half an hour and then began our journey back through the forest. Along the way Patricio saw a tree frog on a rock down in the river. Along the way we also encountered several species of ants including some real aggressive ones, large, microscopic and the infamous leaf cutter ants. 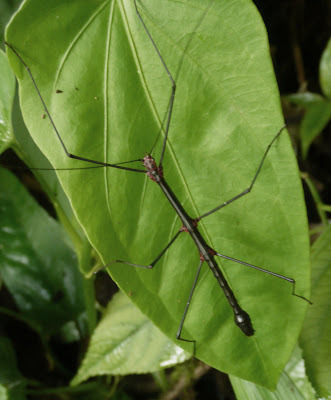 Here is a photo of a stick bug. 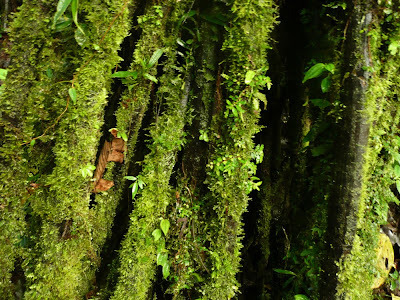 Greg had fun drumming on the hollow Buttress roots of a tree, which made a very loud, reverberating noise out into the jungle. Once we emerged from the jungle we all got back into the van and drove to the base of a bridge which lead to a village of indigenous people. This tiny community had just recently added a school house for the native children. We were escorted to a thatched hut that acted as their "store" where about five indigenous women sat in a circle, some nursing their children. The elder told birth stories to our two guides in Spanish while we looked at the beautiful wares including seed jewelry, fresh Sangre de Drago in small amber bottles, pottery, packages of Una de Gato (Pau d'arco) Tabebuia avellanedae. 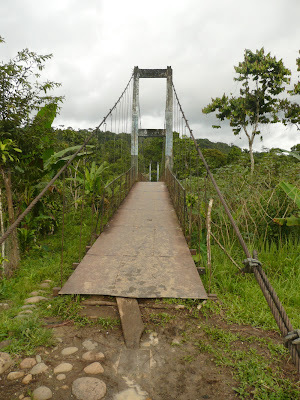 We made some small purchases, headed back over the bridge to the van and from there departed the Hola Vida Reserve. When we arrived back at the hotel we immediately headed to the spa for a bit of time in the wet and dry saunas before dinner.